It was so good, I forgot to take a picture of the full cup! The best chocolate in Los Angeles can be found across the river at one of my favorite Oaxacan restaurants in the city, Antequera de Oaxaca. On days like this, when there is a slight crispness in the air and your body craves a earthy, sweet beverage to make it happy, there’s nothing like this chocolate de leche to warm you up inside. Forget overpriced coffee from dull places like Intelligentsia, a cup of Oaxacan hot chocolate with it’s aroma of cinnamon and nuez is the perfect elixir for the rare chilly Southern California day. 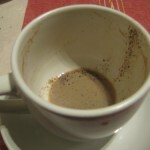 This entry was posted in Food, Greater Los Angeles and tagged hot chocolate, oaxaca by chimatli. Bookmark the permalink. You are right about Intelligentsia being dull, it is. Their coffee is expensive not overpriced. And so far their coffee is the best in Los Angeles. The difference between good coffee is that real good coffee tastes like coffee and everything else only taste good when you add sugar or flavored syrup. Try a latte at intelligentsia, don’t add sugar and that is the taste of good coffee. Don’t bother asking for vanilla or caramel they don’t have syrups. Oh,and by the way. I had some homemade Abuelita chocolate last night. Yum! It was the bomba!!! I concur, my ma’ makes the best chocolate. you can buy abuelita chocolate to last you all week for like two bucks. 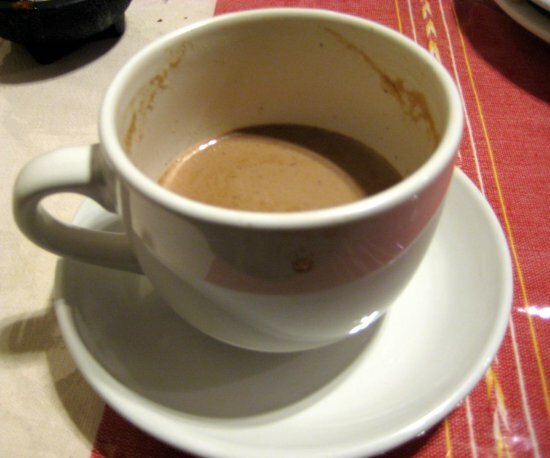 warm up the milk, put it in the blender, add a bar of chocolate (abuelita) and MIX! get some conchitas and you are set! Pancho are you talking about the conchitas from La Favorita? They are freeking good. Have you seen how much manteca they use to make those conchitas? Regarding the Abuelita chocolate. There is no need to blend the chocolate. It will melt with the milk. Simmer the milk untill the chocolate desolves. Use one of those wooden tools they sell at any mexican market to stir the milk. Make sure the milk does not boil over, it will leave a mess. That takes too long. I tried the blender thing once and it tastes the same. I didn’t know there was manteca involved in making conchitas. Must be why they are soo delicious! makes perfect sense. I also wondered why my tacos at home never tasted like the tacos in the street. Manteca is always the answer to any delicious question.. Sorry folks, but Abuelita brand cannot compare to the chocolate you can get in Oaxaca. Oaxacan chocolate is one of a kind and a special blend of freshly roasted chocolate, nuts and other spices. I always bring some back with me on my trips from Mexico. Those Oaxacan restaurants got the pipeline hook-up for quesillo, mole, chocolate and hoja santa. Yum! Yes Chimatli, there is better chocolate bars out there. Abuelita is definately not the best but it will do, when there is nothing else. Go to the mercadito at the border of E.L.A. and Boyle Heights. You could find chocolate from Oaxaca. Lately when I have friends visiting from out of town, I take them to one of my favorite Oaxacan restaurants on this side of town. I’ve never tried the chocolate there, but did ask if they make tortas de camarón during Cuaresma (they don’t). Casi nunca se me antoja el chocolate. Champurrado, ponche, y canela, sí. Pero chocolate? No.